Today I did what I should probably do more often, I kept my mouth shut. I told my Honors Physics class that they were going to prepare and present whiteboards of their video analysis of projectile motion from yesterday and define a general model for a ball thrown through the air. Furthermore, I wasn’t going to contribute to or guide the discussion. It was totally up to them. I managed to keep my mouth shut and they managed to have the best whiteboarding discussion of the year. Their comments, questions, insights, and leadership were great. I took notes the whole time and will try to turn them into a blog post. More than once I cringed as it appeared the discussion was heading off the rails but each time someone stepped up with a great question or comment and brought the class back on track. When I asked about motion graphs and mathematical models, they explained that there was no point to draw them. 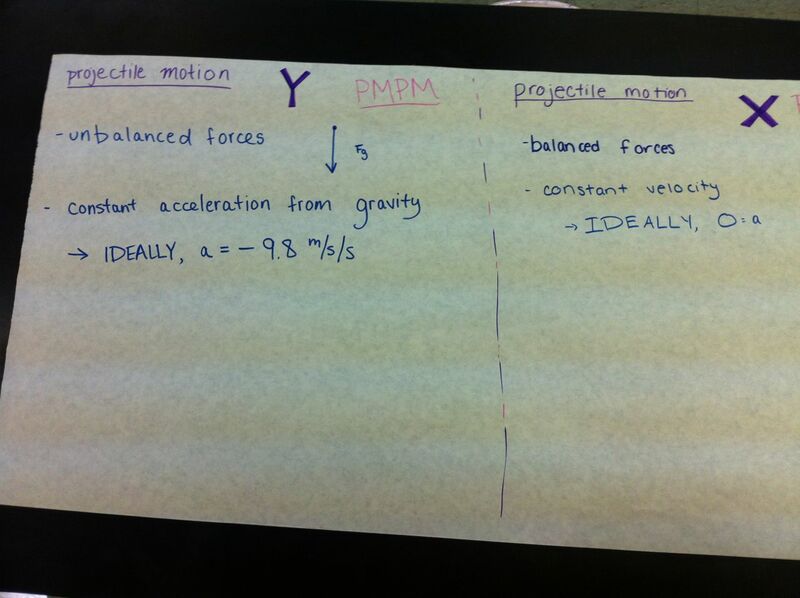 “We identified the balanced forces / constant velocity and unbalanced forces / constant acceleration models. Why draw the graphs again; we all know those models.” Nice. Next Next post: Day 63: Anti-Curious George Escaped!